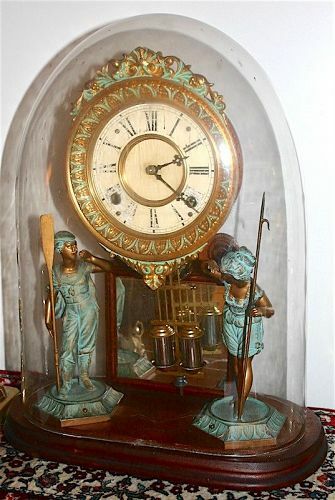 Rare carriage clock by the Vermont Clock Co., Fair Haven, VT. Brass case with beveled glass panels on all sides and carrying handle. 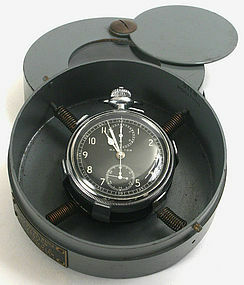 8-day movement with engine turned, decorated steel back plate. Rectangular porcelain dial with Roman numerals in black and minute divisions. Condition: excellent running condition; minor chip to porcelain at top left corner of dial (barely noticeable when viewed from the front view). Size: 6 inches ht. with handle extended x 3 inches wide x 2 5/8 inches deep. A Northern Plains native American pipe with a carved Catlinite bowl and original twisted reed stem. 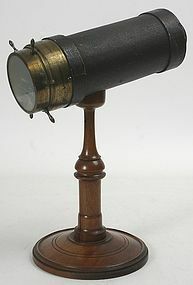 Circa 1870-80. Overall length: 30". The twisted stem has brass tack decoration at the bowl end and attaches to an elbow shaped red Catlinite pipe bowl. Excellent condition, except for a hole in the twisted reed stem. American Revolutionary War era military style wooden canteen. 19th century. Oak hand carved staves held together by four horizontal hand forged iron bands and two vertical bands; two iron rings and hand forged nails. 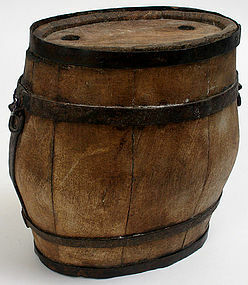 A keg form canteen with two holes in the top; and with two iron carrying rings for a sling. Condition is very good; the upper most iron band is loose. Dimensions: 8" high x 8.5" wide x 5" deep. 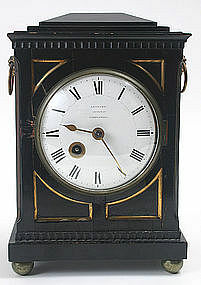 Carriage clock with French 8-day movement, retailed by A. Stowell & Co., Boston. All brass with bevelled glass side panels and round porcelain dial decorated with Arabic numerals set in an engine turned front panel. The exterior with ornate rope twist motifs at the clock's corners. Running condition, with some wear to the exterior's brass finish. Needs a number 5 size replacement key. Dimensions: 6" high x 3.25" wide x 3" deep. Basket-hilt officer's sword with inlaid blade, Scottish, 1796 pattern. 18th century. Brass open work basket hilt with original fish skin grip wrapped in copper wire, and the steel blade engraved and inlaid in gold with emblems of a coronet, a Highlander, and crossed cannons. Excellent condition apart form some wear to the grip. Overall length: 39.25". Blade length: 33.5"
Bronze salute cannon by R.H. Brown, Boston, Mass. Patented Feb. 1890. Patent date and worn maker's mark stamped on barrel. 4 gauge. Fine condition and mounted on a wooden carriage. Size: 21 inches overall length x 11.5 inches depth x 12.5 inches height. Antique smoother plane in brass and Brazilian rosewood with full brass lever cap marked Wm. Marples and Sons. Throat perfect. Double iron. Condition is very good but with an old repair to the handle (see photos). Size: 10 inches x 5 inches x 2.5 inches.